As retailers seek to navigate the new Digital Commerce and provide their shoppers with a seamless experience, they are seeking smart and proactive supplier partners to help craft the strategy, uncover the insights and design. TPG helps suppliers develop a headquarters designed, field-deployed approach to drive joint value creation activities with key retailers in pursuit of a retailer-specific digital commerce plan. 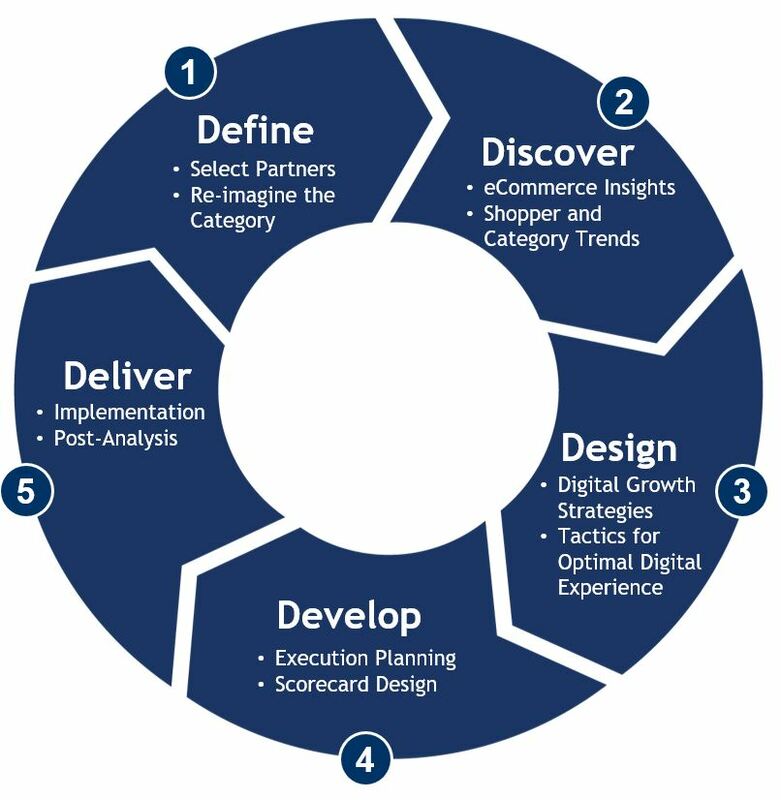 We use the term Digital Commerce to expansively include growth planning involving prior eCommerce and Omni-channel thinking. Digital Commerce Insights and Opportunity Story: TPG reviews existing shopper and category insights regarding Digital Commerce as a feeder into recommended new data acquisition and/or research studies. A category growth opportunity story is crafted from these insights for use to open the dialogue with key retailers. Digital Category Growth Strategies: TPG begins with review of existing strategies for stores and digital commerce. We may recommend an evolution of these strategies based on digital shopper insights and/or new creative tactical concepts for retail in arenas such as the one’s below. Assortment and Packaging Solutions: The development of an assortment optimization plan, and product packaging recommendations designed for Digital Commerce cost and efficiency optimization. Price and Promotion Approaches: Digital Commerce audit analytics will uncover pricing and promotional gaps and opportunities. Retailer best practices will be identified and quantified for online promotions including free shipping, loyalty programs, auto-replenishment, etc. Site Navigation and Taxonomy Recommendations: Specific strategy recommendations will be developed for category-specific site flow and onsite search to encourage the best presentation of your products within the site. Taxonomy usage will also be optimized using consumer language for expedited search and findability. Onsite Search and SEO Recommendations: Onsite Search recommendations will be created for landing zones from key searches and “synonym” lists of terms that shoppers are likely to use and where to link them. Supply Chain Capabilities: TPG will evaluate the current value chain and optimize by creating supply chain flexibility through DC mapping, and optimized cube/weight offerings to reduce cost for you and the retailer. Common solution areas include optimized flow, endless shelf assortment handling and network optimization as well as solutions for optimal shelf / backstock / mini-fulfillment center solutions for bricks and clicks retailers. Shopper Marketing execution: TPG will conduct a review of retailer digital offers to assess the highest ROI. This will include recommendations to invest in current vehicles, as well as create new vehicles and programs which drive value capture and mutual loyalty.